Use AtoZ Downloader to download APK with 3x speed. There are four different game modes in Brawl Stars. Each team will be tasked with grabbing crystals from the center of the map while battling the opposing team. When a player dies, they will drop all of the crystals they have onto the battlefield. The first team to collect 10 crystals and hold onto them for the 16-second countdown wins the match. In Heist, you'll either be on the defending or attacking team. The defending team is responsible for preventing the attacking team from breaking open the safe that guards all their crystals. Each match of Heist only lasts 2.5 minutes; if the safe is still standing by the end of the countdown, the defending team will be victorious. If not, the attacking team will win. Bounty is a good ol' team-on-team deathmatch. Collect stars for your team by defeating opponents, but try not to get picked off yourself. The team with the most stars at the end of the match will claim victory! 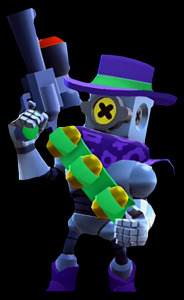 The only game mode that isn't 3v3, Showdown is actually a 10-player free-for-all where the last brawler standing wins! Travel around the map cautiously as everyone is out to kill you and you won't respawn! Be on the lookout for barrels, as they contain power-ups that will give you an edge over your opponents. The longer you last in a Showdown, the better the rewards you'll get at the end of the match. Can you survive until the end? In Brawl Stars, players are ranked by their level and total trophies. Players collect brawlers and select one to use each game. Brawlers, like Clash Royale cards, come in four rarity types: Common, Rare, Epic and Legendary. 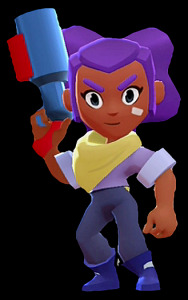 There are currently fifteen brawlers in the game, and only two legendaries. Players open Brawl Boxes to get new brawlers, and occasionally elixir is found in brawl boxes. 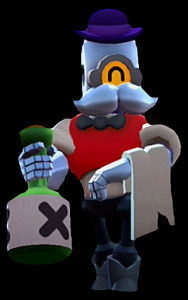 Elixir is used to upgrade brawlers. Players can join bands to play alongside other players. Brawl Stars can be played in four game modes: Bounty, Smash and Grab, Heist and Showdown. Barley lobs a bottle, breaking it and spilling the contents. Its corrosive contents damage enemies standing in the puddle. This one’s on the house! Barley hurls a flurry of fiery bottles, covering a huge area in flames. Get out of there, bad guys! 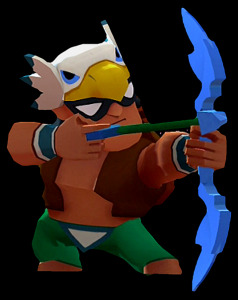 Bo releases a trio of exploding arrows, tearing up enemies like an eagle's talons. Bo hides explosive traps on the ground. Enemies stepping on them get blown up and away! Brock lets fly with a single rockin' rocket that really goes the distance. 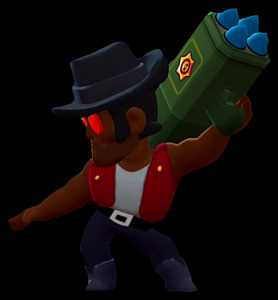 Brock shoots a ballistic barrage of rockets that destroys walls and cover. Enemies that survive get pushed aside. Bull can't see ten feet, but he doesn't need to! His high-powered shotgun can blow off a barn door with ease. Bull charges forward with brute force, bulldozing his way through anything and everything! 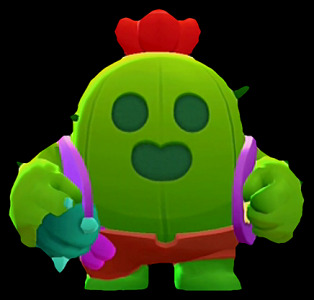 Spike throws a small cactus that explodes, shooting spikes in different directions. Spike invites all seedlings to a cactus party! Enemies caught in the area take damage and get slowed down. Rick fires an accurate volley of bouncy bullets. They ricochet dangerously and can hit targets behind cover. Rick fires a long burst of bouncy bullets that pierce through enemies, fly off walls and through more enemies. 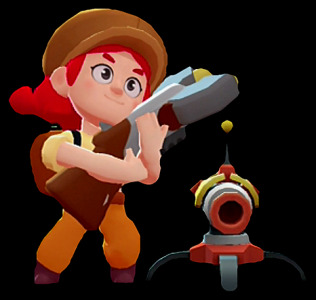 With buckshot shells locked & loaded in her boomstick, Shotgun Shelly can run and gun with the best of them. 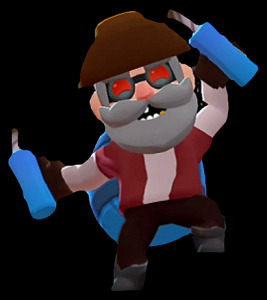 Shelly's supercharged shell obliterates both cover and enemies. Anyone who survives gets knocked back. Poco strums his guitarrón, sending forward bone-jarring sound waves. Enemies hit by the waves take damage. 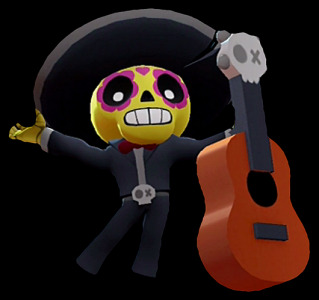 Poco plays an uplifting melody that heals himself and any teammates within range. Encore! Crow throws a triple threat of poisoned daggers. Enemies nicked by these blades will take damage over time. 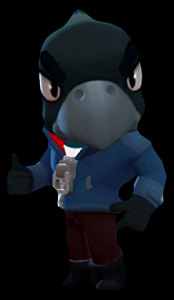 Crow takes to the skies, throwing a ring of poisoned daggers around him both on take-off and landing. 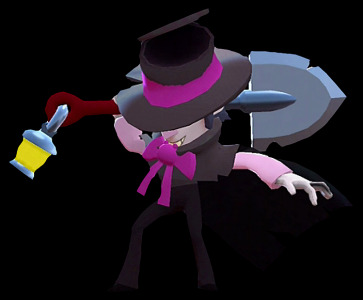 Mortis creates business opportunities for himself by dashing forward with a sharp swing of his shovel. Mortis calls forth a swarm of vampire bats that drain the health of his enemies while restoring his. Creepy! El Primo throws a trio of thundering slaps. A smack down flavored sandwich! 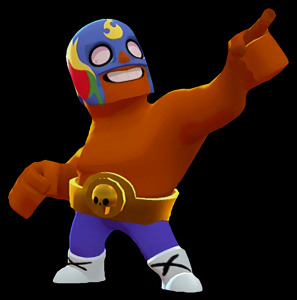 Leaping high, El Primo drops an intergalactic elbow that pounds and pushes away anything he lands on! Mike gleefully lobs two lit sticks of dynamite. Hiding behind a wall won't keep you safe! A big-bada-barrel of dynamite blows up just about everything. Enemies get knocked back on impact! 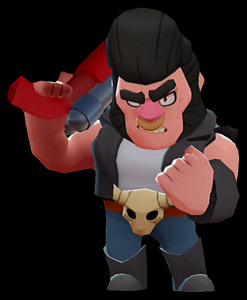 Nita sends forth a shockwave, rupturing the ground and damaging enemies caught in the tremor. 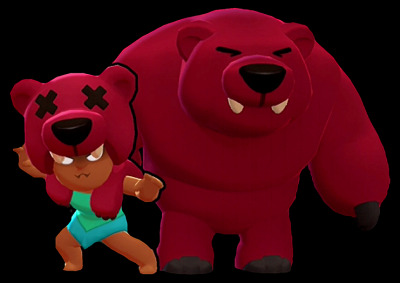 Nita calls the spirit of Big Baby Bear to manifest and maul her enemies. Releases an energy orb that seeks out up to three targets before fizzling out. Jessie cobbles together a gun turret out of random scrap. She's a genius! We provide Brawl Stars APK 16.176 file for 4.1 and up or Blackberry (BB10 OS) or Kindle Fire and many Android Phones such as Sumsung Galaxy, LG, Huawei and Moto. Brawl Stars APK is a free Games Apps. It's newest and latest version for Brawl Stars APK is (com.supercell.brawlstars.apk). 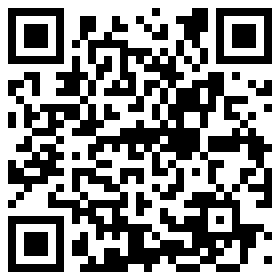 It's easy to download and install to your mobile phone (android phone or blackberry phone). Read Brawl Stars APK detail and permission below and click download apk button to go to download page. Please be aware that we only share the original and free apk installer for Brawl Stars APK 16.176 WITHOUT ANY cheat, crack, unlimited gold, gems, patch or any other modifications. if there is any problem please let us know. 3v3 top-down shooter game where players from all over the world can battle in the ultimate fight! Each team will be tasked with grabbing crystals from the center of the map while battling the opposing team. When a player dies, they will drop all of the crystals they have onto the battlefield. The first team to collect 10 crystals and hold onto them for the 16-second countdown wins the match. The defending team is responsible for preventing the attacking team from breaking open the safe that guards all their crystals. Bounty is a good ol' team-on-team deathmatch. Time to BRAWL! Team up with your friends and get ready for epic multiplayer MAYHEM! Brawl Stars is the newest game from the makers of Clash of Clans and Clash Royale. Jump into your favorite game mode and play quick matches with your friends. Shoot 'em up, blow 'em up, punch 'em out and win the BRAWL. - Showdown: Play solo or with a friend in the rowdiest battle royale! Be the last Brawler standing! - Gem Grab: Collect gems while fighting the opposing team. First team to collect 10 gems and hold onto them wins. - Bounty: Collect stars for your team by eliminating opponents, but be careful not to let them pick you off. The team with the most stars at the end of the match wins! - Heist: Crack the safe protected by the opposing team, and defend your valuables from would-be safecrackers. You have a couple of minutes to determine who leaves with the loot! - Brawl Ball: It's a whole new ballgame! Can your team score two goals before getting blown up? Unlock a variety characters with punishing SUPER abilities, upgrade them with power points, and customize them with exciting skins. Join a Band to share strategies and battle together with other players. Climb the local and regional leaderboards to prove you're the real Brawl Star! - Unlock new, powerful Brawlers - each with a signature attack and a SUPER ability! Are you having problems? Visit http://supercell.helpshift.com/a/brawl-stars/ or contact us in game by going to Settings > Help and Support. Fast download oringial & mod apk. DMCA | Copyright©2001-2017 APK Download. All Rights Reserved. Help us bigger, Submit APKs to DownloadAtoZ.